The day has finally arrived! We’re flying off to Seattle this afternoon to begin our seven-state, two-and-a-half-week journey back to Chicago by car. We first imagined this trip about a year and a half ago and first posted a proposed map in April 2012. It’s hard to imagine how long we’ve actually been planning this, so I’ve put together a little timeline of when we booked our major items like lodging, flight and rental car. We’ve even been able to make some other reservations along the route, like dinner at a James Beard-nominated restaurant in Fargo, North Dakota (thanks Opentable). Our best road trip advice is to always plan ahead and I think we’ve got that covered. Now we just need to watch out for grizzly bears. 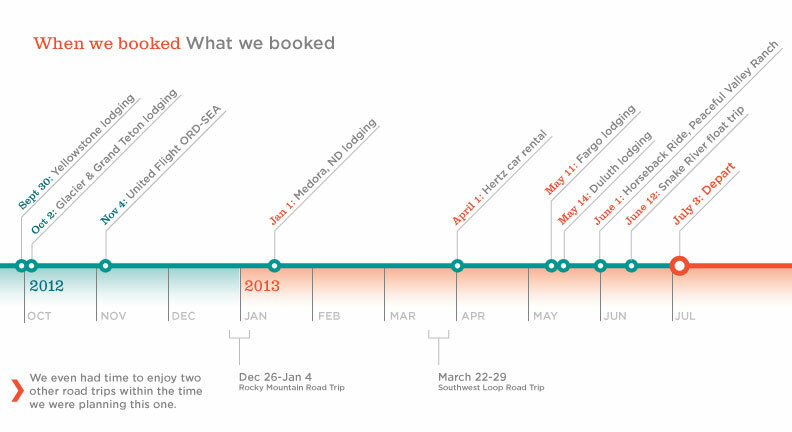 Timeline of our trip planning. Click for larger view. This entry was posted in Destinations, En Route, Travel Tips and tagged road trip planning, Seattle to chicago road trip. Bookmark the permalink.